JIMMY DURANTE AS THE STAR OF THE FLOP "JUMBO" AND CO-STAR WITH GARRY MOORE OF THE UNEXPECTED SUCCESS. Jimmy Durante was a show business legend whose Network Radio career began in failure and ended in success. Durante was already famous for a quarter century - as a jazz pianist, song writer, stage and nightclub comedian with 17 feature films to his credit - when he was cast as the lead in NBC’s Jumbo Fire Chief Show in the fall of 1935. He’s pictured above in his Jumbo role of Brainy Bowers. The show’s unusual name was the awkward combination of Billy Rose’s circus-themed Broadway production Jumbo, upon which the show was based, and sponsor Texaco attempting to cling to the popularity of Ed Wynn’s Fire Chief Show, cancelled four months earlier after a highly successful three year run. (Fire Chief was also the brand name of Texaco gasoline advertised as, “…meeting U.S. standards to power fire and emergency vehicles.”). The peculiarity of the show’s title was more than matched by the program itself. Written by playwrights Ben Hecht and Charles McArthur with original music supplied by Richard Rogers and Lorenz Hart, Jumbo Fire Chief was a lavish production with a 35 piece orchestra and 32 voice chorus. The program was staged at a weekly cost of 15 thousand dollars from the “sawdust ring” of New York’s Hippodrome with an audience of 4,500. However, announcer Louis Witten cautioned the crowd not to laugh or applaud during the show as it might interfere with the radio audience’s enjoyment of the program. Jumbo may have been entertaining theater - the stage production ran for 233 performances over five months with Durante and his radio co-stars Donald Novis and Gloria Grafton in the lead - but it was, quite frankly, bad radio. The first program of the series from October 29, 1935, is also posted below. Its only highlight is Novis and Grafton singing Rodgers & Hart's standard My Romance. Meanwhile, the audience sits on its hands and Durante waits until midway in the half hour to make his entrance. When he finally does, his jokes get no laughs. The listening pubic obviously wanted more than Jumbo Fire Chief had to offer. 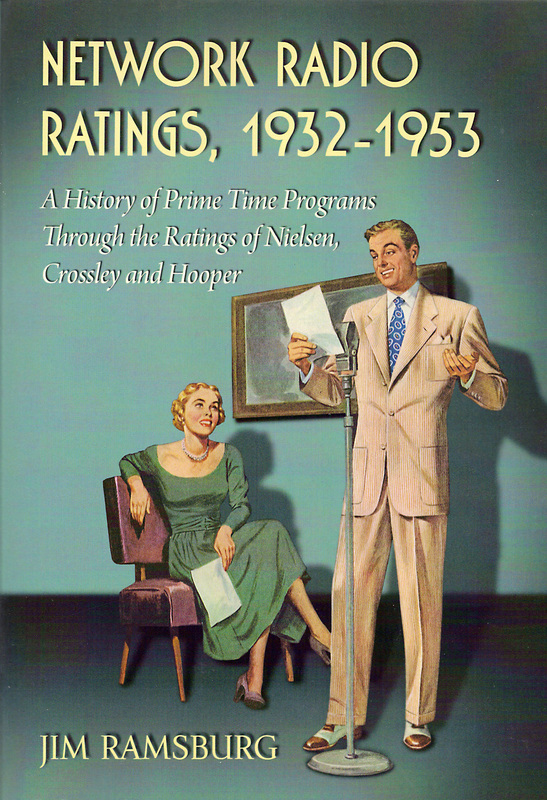 Network Radio Ratings, 1932-1953 reports that the lavish production registered an average rating of 7.3 in its 9:30 Tuesday time period - third place against Blue’s Helen Hayes Theater with a 10.9 and Fred Waring’s Pennsylvanians’ 10.3 on CBS. Jumbo Fire Chief was cancelled on February 25, 1936. Jimmy Durante was the fall guy in the fiasco and nobody wanted to hire the comedian to headline another Network Radio series. So, he was content with Broadway roles in 1936’s Red Hot & Blue with Ethel Merman and Bob Hope, 1939’s Stars In Your Eyes with Merman and 1940’s Keep Off The Grass with Ray Bolger, plus a steady stream of nightclub appearances and occasional movie roles. Jimmy and Jeanne Durante moved to Los Angeles around the time of his filming Warner Brothers’ The Man Who Came To Dinner in 1941, although prior commitments forced the comedian to return to the East Coast frequently for personal appearances. It was during one of his trips that his wife of 22 years, who had a history of heart problems, died suddenly on February 14, 1943. Durante cancelled his tour and returned home grieving over the loss of Jeanne. Another comedian was having problems, too. Lou Costello of the Abbott and Costello comedy team was only 37 and suffered from a sore throat which he dismissed as overwork with the duo’s heavy schedule of two movies a year for Universal and their new hit radio show for Camel Cigarettes that had become part of NBC’s powerful Thursday night lineup with ratings in the 20’s. Costello also suffered from occasional dizzy spells and shortness of breath but he ignored them, too, as the price of success. He didn’t know the warning signs of rheumatic fever. Cohan immediately thought of rising radio comedian Garry Moore, 27, who was already signed to become Abbott & Costello‘s vacation replacement during the following summer. But taking over the show’s time period on what amounted to a summertime tryout was far less risky than abruptly moving in during the middle of the season. So it was determined that newcomer Moore, who was known only to daytime audiences, should be teamed with an established star, preferably another comedian. Cohan considered the possibilities and took a chance. He called on Jimmy Durante, convincing the 50 year old comedian that several months of radio work with Moore was just the therapy he needed to overcome his grief. The Jimmy Durante & Garry Moore Show went on the air only days later on March 25, 1943. Pictured above, the new team was a perfect fit and sounded as if they genuinely liked each other - which they did. The fast-talking Moore always treated Durante with a breezy deference reserved for a father figure. In return, Durante always called Moore “Junior” in their routines written by Syd Resnick that often involved complicated linguistics that left Durante’s speech in shambles while Moore could untie the toughest tongue twisters with ease. The few months Durante expected from the show ran on through the summer on NBC and continued through the next four seasons on CBS, never dropping out of the nightly Top Ten. An episode of their CBS show is posted below. Jimmy Durante refers to his amicable parting with Garry Moore in the interview also posted below. Both returned to NBC in 1947-48 - Durante continued his own successful series for three seasons and Moore hosted the comedy quiz Take It Or Leave It for two years. As Network Radio’s Golden Age faded, both moved into television and enjoyed great success..
A soft-spoken Jimmy Durante heard in the interview describes the loss of his first wife and the joy brought to him by his second wife, Margie, who was 28 years younger, and their adopted daughter Cecelia, “Cece”. The first was that which audiences had become most familiar - the rambunctious, manic comedian named Banjo in Warner Brothers’ screwball comedy, The Man Who Came To Dinner, adapted from the George S. Kaufman-Moss Hart stage hit. Filmed in late 1941, Durante’s brief role grabs all the attention away from notorious scene stealers Bette Davis and Monty Woolley. His second persona is seen in MGM’s Two Girls & A Sailor, from 1944. A far more subdued Durante plays the retired vaudevillian Billy Kidd, a recluse who lives in the rear of a deserted theater. Although the character eventually comes out of his shell to sing Inka Dinka Doo with the Harry James band, Durante displays a warmth and depth of character that was more his genuine self. Jimmy Durante died on January 29, 1980 at the age of 86. He left a legacy of film and recordings for all to enjoy today. (1) Bud Abbott performed the March 11th show with comedian Bert Lahr and Hal Peary as The Great Gildersleeve appeared with Abbott on March 18th as the new Durante & Moore program was being assembled.